Go to any fitness center and you will see the poser—the guy who can’t walk by a mirror without flexing his “guns.” He grunts loud when lifting, then dramatically drops the weights to the floor. He waddles back and forth to the water fountain convinced everyone in the room is impressed with his muscles. Yet all this guy does is train. He’s not training for a purpose. He’s not conditioning himself for longevity. He’s not disciplining his body for a determined outcome. He wants to look like he could do something. In a past season of Survivor one contestant was ripped in muscle. He was a true physical specimen. It looked as if no one on the island had a chance to compete with him. That was until one of the challenges. A petite young lady out paced him, was more aggressive, more flexible, and more physically cunning. He dropped out of the challenge exhausted and finally dropped out of Survivor. 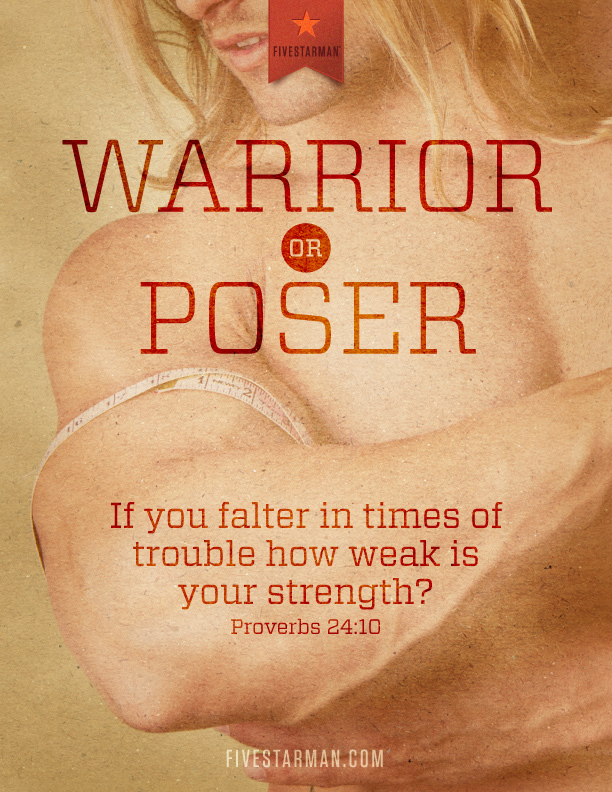 Unfortunately, there are a lot of posers in life. Men who strut and pose through life thinking their look alone will earn a place in the victor’s circle. They soon discover that’s not how life works. Life, business, family, even our spiritual walk is a challenge. If we’re going to win, we need to be conditioned for it. We need to be strong. Let me give you an example. In recent years the economy has been receding. This recession has wreaked havoc on a lot of men. Following the irrational economic exuberance of the 90’s and early 2000’s, many have found these last few years to be discouraging, draining, and disheartening. Yet this is the time to step up. To face the challenge head on. We don’t need to shrink back and quit. We can’t waste our time reflecting on the ‘good ol’ days.’ Nostalgia is an obsession for an unattainable past. We can’t go back. We need to press forward. One of the greatest challenges we have when faced with financial shrinkage is to overcome the tendency to withdraw and hide out. Don’t allow yourself to dig a hole and climb in. Don’t succumb to the pressure. You can’t afford to go into seclusion. In biblical times, a recession was called a famine because the economy primarily relied upon seasonal crops. If weather conditions were not favorable the crops would not yield its harvest leading to an economic collapse. Isaac, the son of Abraham, experienced a terrible famine. The wisdom of the day was to relocate to Egypt where there was plenty of food. Yet, God spoke to Isaac specifically to not go to Egypt but to plant crops instead. Rather than withdrawing and holding on, trusting in false hope that things would simply change, Isaac planted seed in dry ground. He reaped a hundred fold return that year! It may not make sense to the crowd but when God gives you specific instruction concerning your business, your finances, or your family’s well-being, go for it. Move ahead. The lesson here is this: You’re not conditioning yourself just to look good. You’re preparing for the challenge. You are strengthening yourself so when crisis occurs—and it will—you are prepared. Don’t shrink back in times of trouble. Be a man and be prepared. Gallant: Outdated Concept or Worthy Goal? The most encouraging,anointed article I ever read.